It goes without saying that a well organized and auditable quality management system (QMS) is job number-one for medical device manufacturers. However, a surprising number of organizations are still using Microsoft Office — specifically Word and Excel, both of which were invented in the 1980s — to manage their quality and design systems. Microsoft Office and its fast growing rival Google Docs are great office tools to write articles (like this one), track checklists, perform financial analysis, and even make group presentations. 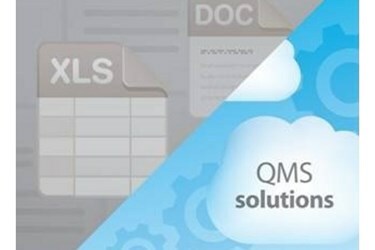 However, in this century, there are much more powerful and appropriate QMS solutions on the market, solutions that can connect to anyone anywhere from the cloud, and that support 21 CFR Part 11 electronic record requirements, for instance. No longer should the QMS, which contains critical product records — including the design history file (DHF), device master record (DMR), and quality processes issues; corrective actions/preventative actions (CAPAs); and eight discipline (8D) processes — be stored in a combination of Office files on the corporate server or even (augh!) hard copy paper files stored in a locked filing cabinet. In 1988, these tools were acceptable, because that was how it was done back then. At that time, organizations even required people to hold formalized meetings with hard copies of engineering change orders (ECO) and CAPAs that culminated with a group sign-off with an actual pen — black ink preferred! Then, someone from document control would stamp each page, initial, and, if needed, manually type the new item into the material requirements planning (MRP) system. At the end, the master file would be placed into a file folder and delivered by cart with the daily load of file folders back to the “file room” to be placed into its special storage location. Ah, those were the days, right? Unfortunately, in many organizations, the QMS operates as if it were 1988 all over again. Records are highly relational and include various associated data and files. Within the device master record and design history file for each product, all revisions, parts, and drawings must remain properly linked and tracked. Spreadsheets, network server folders, and/or paper file folders alone provide no integrated way to aggregate all related item data. Maintaining a system of spreadsheets and network file folders in a validated state is highly challenging. Device master record and design history file records must be available for quality audit by the FDA at any time, with history requirements that can extend back for many years. Over time, different manual processes, personnel changes, and the accumulation of isolated files such as spreadsheets and Word documents inevitably introduces increasing management complexity. And with that complexity, a series of data quality reliability issues often emerges during preparatory internal audits, requiring significant corrective actions and costly labor-intensive double-check preventative actions around documentation control. Throughout the lifecycle of a product, numerous revisions of product information are created and communicated to multiple internal and external teams. Keeping everyone on the latest revision of product data when it is spread over local computers and in various spreadsheets and paper files is a nearly impossible feat. It is especially difficult for external partners and suppliers to obtain current product information. A modern product record often includes a complex set of hundreds to thousands of structured items. Poring over thousands of rows and columns in a standalone spreadsheet to modify data naturally leads to the opportunity for errors. Every record must be checked, since there is no basis to leverage previous work. Because a system of spreadsheets does not have integrated change management capability, changes are difficult to trace and store, appropriate compliance documentation is difficult to generate, and finding errors when they occur is very difficult. Even after the first version of a product is built, the product record will continue to evolve as quality and other issues come to light — defects, design improvements, manufacturer components changes, etc. — until the product reaches its end of life. The time spent to make and document changes manually and fix mistakes throughout the lifecycle of a product is significant and often obstructs a critical path that results in a substantial delay in its shipment. To attain and maintain FDA approval, it is critical that all product record changes are both documented and traceable, with appropriate signoff by responsible parties. Revisions must be clearly verified and validated according to accepted processes. Real-time accessibility to accurate product information is a key success factor in medical product development, manufacturing, and compliance. Companies must ensure that engineering and operations teams, design partners, quality team members, outsourced manufacturers, and suppliers all have secure access to a single, unified version of product data. Standalone spreadsheets and documents just do not lend themselves to providing and sharing this single version of complete and traceable product information. Many companies have multiple products with layers of data that are interrelated, such as part data, mechanical files, electrical component sheets, bills of materials, approved vendor lists, and costing data. In a manual spreadsheet environment, the associated data is updated and communicated separately for each product yet has to be kept in sync. Quality issues that apply across product sets are difficult to see and communicate across the product teams. Many seasoned medical product development and manufacturing teams recognize the significant scope of today’s document control requirements and the severe limitations of spreadsheets and paper files in meeting their objectives. They fully recognize the need for a next-generation solution to replace inadequate manual spreadsheet tools. Demonstrating strong market growth in the past few years, collaborative QMS solutions are effective tools that bring together the design, quality, and manufacturing worlds. Ideal for medical device companies maintaining device master records, design history files, and change processes, these QMS solutions can successfully address challenges resulting from spreadsheet and document-based manual documentation management processes. Steve Chalgren is VP of product management and strategy at Arena Solutions.